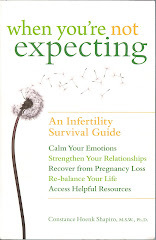 Hopefully yours, Connie: Sharing infertility news: How to reach some decisions with your partner. Sharing infertility news: How to reach some decisions with your partner. From the moment you suspect the word infertility could apply to you, there is an emotional pause as you struggle with how open you will be with your apprehensions. As months pass, as diagnostic tests or pregnancy losses increase your anxiety, the questions still loom: whether or how to take others into your confidence on this very personal matter. So what are the questions you and your partner will need to consider? Together you have undoubtedly spent hours discussing how both of you are viewing the news you are receiving from medical professionals, from your own collection of information, and possibly from local infertility support group members. But the big question you both need to be clear on is how open to be about your news and with whom. Each of you needs to be respectful of the other's wish for privacy, which initially may include no sharing of any news, and eventually is likely to include what news is acceptable to share. As you discuss this issue with your partner, you will want to focus on why it would be helpful to you if both of you could consider a certain perspective, and why you, in particular are, feeling a strong need to move forward in a new direction. This puts the positive framework of "problem solving" on the discussion, rather than the more negative dimensions of power struggles or selfishness. So here are some considerations for both of you. Chances are that once a piece of information is shared, it will be shared broadly, even if you have asked your confidante to keep it private. This happens in several ways. Your confidante, with all sincere wishes for your emotional welfare, may want to create a small group of supportive others, alerting them perhaps to only a small piece of the information you have shared, and in the process arousing further curiosity ("I don't think it's just PMS that makes Janet so upset every time she gets her period."). Another possibility is that your confidante may feel somewhat overwhelmed to have learned the information you have shared, and may feel the need for help with the anxiety the news creates ("I'm feeling so helpless since Suzanne told me she is being tested for infertility -- I wish there were some way I could help her."). And then, there's always the possibility that your confidente is a bit of a gossip girl and thinks she will become the center of attention as she shares even a small bit of your news ("I never imagined that infertility is what is making Katie so edgy these days -- what? you didn't know? well, here's what she told me....") So whether it is concern for your welfare or a disregard for your request for privacy, the news will pass among friends and family members once you have begun to share it, no matter with what expectations of discretion you may have. That brings us to the next question of how you and your partner can come to agreement on what to share, now that you know the word ultimately will circulate to a circle of family and friends. You might begin by asking yourselves what are your own issues of privacy. Is there some stigma associated with thinking of yourselves as infertile? Are you concerned that curious loved ones will pry further to learn more information than you want to divulge? Do you want to avoid well-meaning advice from folks who are not knowledgeable about the medical aspects of your infertility? Whatever your issues of privacy may be, you both can probably find ways to deflect inappropriate remarks or to correct misinformation. What may require further effort on your parts is the question of stigma. These days, with infertility being so much in the news, affecting so many well-known celebrities, and being heralded for medical breakthroughs, stigma has much less power than in the late 1900's. So rather than focusing on stigma, you both could consider discussing how you think others may view you differently if they hear your news -- chances are you'll arrive at the conclusion that others will be concerned about how they can help, will share information about acquaintances in their lives who have grapplied with infertility or pregnancy loss, and will want to have some sense about how much you want to talk further about your infertility. So one major effort you and your partner need to make is how you want to present your news so that you'll minimize intrusive behavior of others while creating compassion for the challenging times ahead for both of you. You'll probably want to decide how much initial news to share and, as you offer medical information, you'll probably also want to offer suggestions for how others can help. This can range from "I'll appreciate some extra thoughtfulness if I tell you I've just gotten my period" to "feel free to ask us about how things are going, and if we don't mention our infertility, then it means either there's nothing new to report or we're not in the mood to discuss it right then." This leaves open the door for ongoing conversations at whatever time those offers would meet your needs. The topic of sharing infertility information is multi-faceted, and in today's blog I have tried to address some of the most challenging aspects. In my recent book When You're Not Expecting, I devote a fair amount of attention to the issue of how/when/whether to share, and there is a reason for this. The burden of infertility easily can become too heavy for a couple to keep to themselves. It crowds your conversations, it intrudes constantly, it makes you feel "stuck," and it can make you feel emotionally isolated and barricaded. Being able to share information can create a sense of broad support, concern and compassion (okay, so it also can create some unwanted intrusions, but that goes with the territory of having people concerned about you). So I hope this blog will help you and your partner to open discussions about how to begin (or continue) sharing infertility information in a way that generates the emotional support that is so important as you face the ongoing challenges of infertility and pregnancy loss.